Wouldn't it be terrible to live in a climate and area where fly fishing opportunities abounded the whole year round? There would be no "off-season" in which to regroup one's energies or to reflect on the successes and failures of the previous year. We'd be without valuable down time to prepare for those new adventures that are waiting for us a few months ahead. Interior lakes are frozen and, on the coast, the last of the chum salmon are finning aimless circles, waiting to die. (At risk of creating covetedness among the interiorites, we won't dwell on the fact that we coasters do have year long fly flinging opportunities. Sometimes on nice winter days, it's hard to choose between time astream, a round of golf, or an excursion in the sailboat.) It's sufficient to say that, even on the coast, winteris a time when most of us choose to be fireside warm rather than frozen to some streamside boulder. So now, when there is some spare time away froma whole lot of nifty fishing temptations, is really the time to lay out and execute some plans for improvement. What better objective than to work on our flycasting?! "Why bother now?" "There will be lots of opportunity during fishing season to practise and improve" "I'm quite happy with my casting and I catch fish, so why get worked up about fly casting anyway?".....Hmmm?? Here's the sales pitch for the improvement plan. Fly casting is the foundation or essence of fly fishing. If you can't deliver the fly properly to the fish, you are seriously disadvantaged. Fly casting is a fairly complex process and therefore requires some serious attention. The caster needs to be able to use limb and body movements to present a light lure (the fly) using a heavy line and a special tool (the fly rod) to a variety of quarry under many different physical, climatic and even emotional conditions. The improvement side of the process is something that never ends. Happily there is no such thing as achieving perfection, only the interesting challenge of a continual search for it. The poetry and beauty of fly casting is what sets fly fishing apart from other forms of angling (just look how the movie "A River Runs Through It" has influenced many to take up the sport). Better casting will reduce fishing frustration, be more personally satisfying and ..... you'll sure be able to show off more effectively! When you are out fishing is just about the worst time to concentrate on fly casting improvement. There are just too many variables that will prevent total focus on the elements of casting. Think of these interferences :-wind, bushes in front and behind, cold fingers, up to the waist in water, mosquitoes, difficult to see exactly what the line is doing and how the cast has really performed. To make matters worse, those pesky fish will likely even interfere from time to time! Advice and assistance - There is a wealth of information available on flycasting in the form of videos, books and magazine articles. If you bang your computer hard enough there may even be on-line places with fly casting advice. 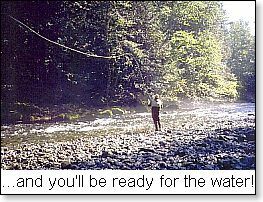 Seek out material by some of the gurus of fly casting instruction: Mel Kreiger, Lefty Kreh, Gary Borger, Joan Wulff, Doug Swisher, BillyPate, Al Kyte, Tom White, Mike and Denise Maxwell and others. Most of these people have both written and video material. They all have tons of years of instructional experience and there own "style"of explaining and teaching. The key elements of what it takes to make good fly casting is common to them all, even though their explanations and choice of words make them appear to be different. The videos are a great way to go! Most are well done, with easy to see casting actions interspersed with on-the-water examples of how a casting lesson should work in real fishing. Often an instructor will have several videos (introductory as well as advanced casting) and possibly a book to back up the videos. Books and magazine articles are a useful way to study the techniques in depth (via the written descriptions and diagrams) and provide an easily accessible reference when required. Fly fishing mags frequently provide casting articles. These are worth clipping/copying in order to create an additional source of casting reference material in a ring binder. Search out back copies of the mags in second hand book stores. The local fly shop should have (or can get) the various books and videos on casting. Most shops will rent the videos. So commandeer the TV this winter and run through a variety of these videos. You surely won't feel like it when the trout are gorging on mayfly duns under a brushy bank and behind the big rock - just when you'll need the casting skills that you could have acquired in the slow season. There is nothing wrong with renting a fly casting instructor for an houror so. Skiers, tennis players, golfers and bowlers do it in order to get by the painful early stages of learning , to acquire more sophisticated techniques, or to iron out problems. For some reason, we fly fishers are often reluctant to seek out professional help and to spend a few dollars (remember this fly fishing may be a life-long condition, so why be afflictedwith unhappy casting skills?). Once again, the local fly shop is the place to ask about casting instructors. The Federation of Fly Fishers (FFF) has a program to "certify" fly casting instructors and, increasingly, instructors with these qualifications will be available. Certification helps to assure students that they are getting an instructor who has the skills to teach others (this doesn't imply that those without credentials can not be effective teachers). Practice, practice, practice - Even though it's cold and miserable out there, you should want to seek out your local soggy piece of schoolyard lawn or snowpatch, and flog away. All that video and book research should have you quivering for perfection. So what if your neighbours are able to confirm the mental instability they always believed you suffered from! 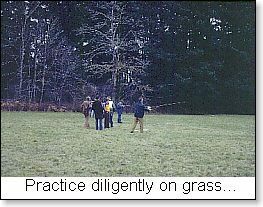 The best way to practice fly casting is to do it on terra firma (grass or areasonable facsimile). If you choose your site well, there will be no interference from brush, wind, or stray cats. The dry land stuff allows you to cast against a measured distance (try a line marked off in 5 foot intervals); to setout targets for accuracy practice, and to walk out your cast to see how it fared (did it really straighten out or did the last 10 feet of a 70 foot cast land in a pile?). Under controlled conditions, you will be able to practice the various casts, correct them, and repeat them many times. This process of locking-in the correct way, between eye body and brain, is essentially what practice is really for. You may have to repeat the correct move many thousands of times until it becomes instinctive. Gear check - there is no sense in trying to achieve better flycasting if your rod, line and leader are not in balance. These days, it's much harder to purchase an unbalanced outfit, as manufacturers provide excellent tools throughout their price range, and shops dispense good gear advice. However, if your gear is of uncertain origin and balance, take it to a shopor an experienced fly caster for advice. The ideal set-up for practice is a medium weight outfit (line weight #5 to #7). Use a brightly coloured floating fly line and a 9 foot tapered leader to which is tied a small piece of bright yarn (don't use any part of a real fly for practice as this is dangerous for bystanders who may want to sue you for a lost eye!). The bright fly line is essential for you to better see how your casting is behaving. There must be a pause at the end of both the front and back portion of the casting stroke, which varies in duration with the amount of line beyond the rod tip (ie. more line = longer pause). Slack line, during the casting process, must be kept to an absolute minimum. The rod tip must move in a straight line path during the casting stroke. The stroke length (or size of the casting arc) must vary with the length of line past the rod tip. Power must be applied in the proper amount and in the proper place in the casting stroke. Keep these 5 elements in sight, watch videos and read, practice awafrom fishing, and you will improve the quality of your fly casting, no matter how much experience you have.